MFW: You’ve got a hell of a lot of something Sam. Sam Shepard (born Samuel Shepard Rogers IV; November 5, 1943) is an American playwright, actor, and television and film director. He is the author of several books of short stories, essays, and memoirs, and received the Pulitzer Prize for Drama in 1979 for his play Buried Child. Shepard was nominated for an Academy Award for Best Supporting Actor for his portrayal of pilot Chuck Yeager in The Right Stuff (1983). Shepard received the PEN/Laura Pels International Foundation for Theater Award as a master American dramatist in 2009. Born Samuel Shepard Rogers IV in Fort Sheridan, Illinois, he worked on a ranch as a teenager. His father, Samuel Shepard Rogers, Jr., was a teacher and farmer who served in the United States Army Air Forces as a bomber pilot during World War II; Shepard has characterized him as “a drinking man, a dedicated alcoholic”. His mother, Jane Elaine (née Schook), was a teacher and a native of Chicago, Illinois. Shepard was forced to support his mother and brother when his father’s farm lapsed into insolvency. After graduating from Duarte High School in 1961, he briefly studied agriculture at Mt. San Antonio College, where he became enamored with the oeuvre of Samuel Beckett, jazz, and abstract expressionism. Shepard soon dropped out to join a touring repertory group, the Bishop’s Company. After securing a position as a busboy at The Village Gate … after winning six Obie Awards between 1966-1968, Shepard emerged as a viable screenwriter … drummed sporadically from 1967 through 1971 with psychedelic folk band The Holy Modal Rounders … (1968). Shepard’s early science fiction play The Unseen Hand (1969) would influence Richard O’Brien’s stage musical The Rocky Horror Show. Cowboy Mouth—a collaboration with then-mistress Patti Smith—was staged for one night at The American Place Theater in April 1971, providing early exposure for the future punk rock singer; seeking to distance himself from Smith and his substance abuse, Shepard relocated with his wife and son to London in the early 1970s. Returning to America in 1975, he moved to the 20-acre Flying Y Ranch in Mill Valley, California and served for a semester as Regents’ Professor of Drama at the University of California, Davis. Shepard accompanied Bob Dylan on the Rolling Thunder Revue of 1975 as the ostensible screenwriter of the surrealist Renaldo and Clara (1978) … His diary of the tour (Rolling Thunder Logbook) was published by Penguin Books in 1978. A decade later, Dylan and Shepard co-wrote the 11-minute “Brownsville Girl“, included on Dylan’s Knocked Out Loaded (1986) album and later compilations. In 1975, he was named playwright-in-residence at the Magic Theatre, where many of his notable works (including his Family Trilogy: Buried Child , Curse of the Starving Class , and True West ) received their premier productions. Some critics expand this grouping to a quintet which includes Fool for Love (1983) and A Lie of the Mind (1985). 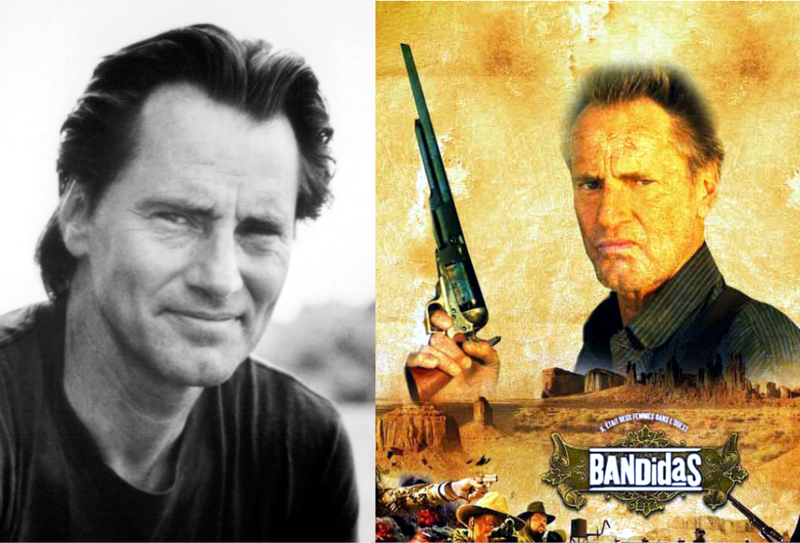 Shepard began his acting career in earnest when he was cast as the handsome land baron in Terrence Malick’s Days of Heaven (1978), opposite Richard Gere and Brooke Adams. This led to other important films and roles, most notably his portrayal of Chuck Yeager in The Right Stuff(1983), earning him an Academy Award nomination for Best Supporting Actor. By 1986, one of his plays, Fool for Love, was being made into a film directed by Robert Altman; his play A Lie of the Mind was Off-Broadway with an all-star cast including Harvey Keitel and Geraldine Page; he was living with Jessica Lange; and he was working steadily as a film actor—all of which put him on the cover of Newsweek magazine. Throughout the years, Shepard has done a considerable amount of teaching on writing plays and other aspects of theatre. His classes and seminars have occurred at various theatre workshops, festivals, and universities. Shepard was elected to The American Academy of Arts and Letters in 1986. He was elected a Fellow of the American Academy of Arts and Sciences in 1986. In 2000, Shepard decided to repay a debt of gratitude to the Magic Theatre by staging his play The Late Henry Moss as a benefit in San Francisco. The cast included Nick Nolte, Sean Penn, Woody Harrelson, and Cheech Marin. The limited, three-month run was sold out. In 2001, Shepard had a notable role of General William F. Garrison in the box office hit and cult classic movie Black Hawk Down. Although he was cast in a supporting role, it reinvigorated interest in Shepard among the public and critics alike. He performed Spalding Gray‘s final monologue Life Interrupted for its audio release through Macmillan Audio in 2006. In 2007, Shepard contributed banjo to Patti Smith’s cover of Nirvana’s song “Smells Like Teen Spirit” on her album Twelve. Although many artists have had an influence on Shepard’s work, one of the most significant has been actor-director Joseph Chaikin, a veteran of the Living Theatre and founder of a group called the Open Theatre. The two have often worked together on various projects, and Shepard acknowledges that Chaikin has been a valuable mentor. Shepard starred in the 2011 Western film Blackthorn. It’s unbelievable what this guy has done. And I tried to edit it in a vain attempt to make it shorter.